*New and Improved with more installation clearance and long term strength! ** THE most affordable FULL stainless constructed SMOG passable cat out there!! 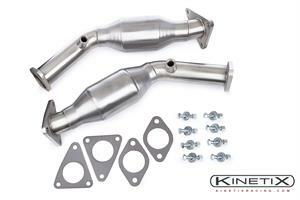 The factory catalytic converters are well known as the biggest "choke point" in the factory exhaust system. These high flow stainless spun catalytic converters blow away the stock converter flow rates while still maintaining legal emissions levels. 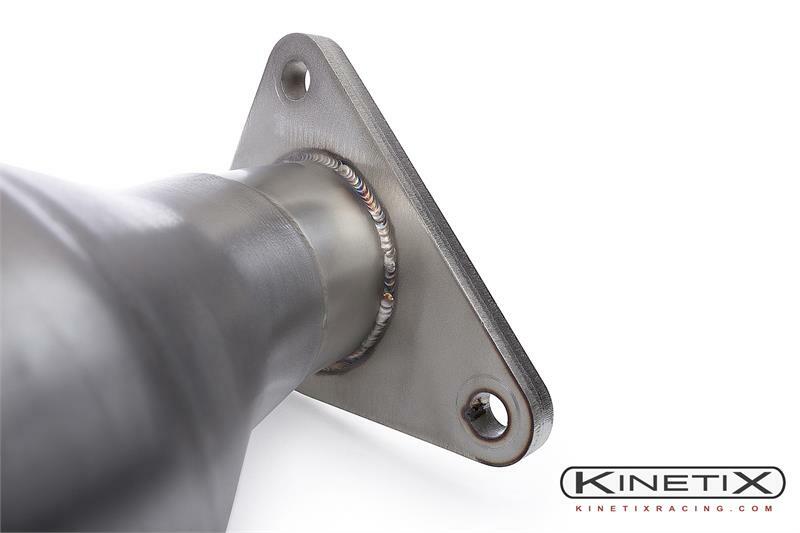 Constructed with stainless tubing and 3/8" stainless flanges. Fully TIG welded and true mandrel bends used throughout. These converters will bolt up to any header (factory or aftermarket) and any exhaust (factory or aftermarket). These pipes also retain the factory Oxygen sensor location and WILL NOT THROW A CHECK ENGINE LIGHT!!. Expect great performance gains from these converters as they have dyno'd between 7-9 hp at the wheels on factory 350Z's. They only add a slightly more aggressive exhaust note and do not have the pesky "raspiness" between 3-4k rpm that is seen with straight through test pipes. These pipes come complete with gaskets, bolts, washers, and lock nuts. ** Please check local laws regarding catalytic converters. Our cats are 49 state legal and do not have a CARB number associated with them. © 2019 Kinetix Racing - Performance Upgrades for your Nissan 350z and Infiniti G35, All Rights Reserved.